The Modern and Contemporary Art Section of the Department of Art Research, Archives, and Information Systems has continued Research on the History of Cultural Exchanges of Modern and Contemporary Art. This research project covers modern and contemporary art from Japan and other parts of East Asia. 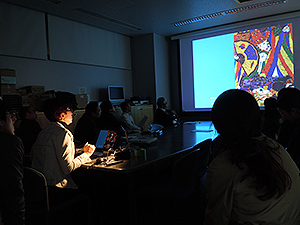 As part of that project, a seminar of the Department of Art Research, Archives, and Information Systems on February 17th featured a presentation by Ms.INABA Mai, an Associate Professor at Kwangwoon University in South Korea. The presentation was entitled Korea’s “Dong Yang Hua(East Asian Painting)”. The genre now known as Dong Yang Hua in South Korea originally developed when Nihonga(Japanese style Painting) took hold in Korea during the era of Japan’s colonial rule. In criticism of Oriental Painting after the end of that rule, the term South Korean Painting referred to the same genre of painting but connoted establishment of an ethnic identity. The term Han Guk Hua(South Korean Painting) came into vogue starting in the 1980s. Professor INABA’s presentation described the political context for the term Dong Yang Hua and events leading up to use of the current term South Korean Painting. The presentation also covered related topics and featured examples of representative works. The concept of Nihonga was established after Japan’s modernization. This concept was actively discussed by critics, art historians, and artists in Japan from the 1990s to the early 2000s. Over the past few years, artists producing Nihonga have been re-examining the concept in light of Mineral Pigment Paintings and Gouache Paintings that have developed in parts of East Asia such as China and Taiwan. The seminar looked at the nature of Korea’s “Dong Yang Hua in light of its shared origins and its unique developments within national boundaries. The seminar provided a good opportunity to reconsider Nihonga in comparison. Friction between Japan and South Korea with regard to an awareness of history is constantly discussed. The seminar was attended by Ms. KIM Kibum (a curator at the National Hansen’s Disease Museum), who remarked that “we should not ignore the unfortunate circumstances under which the two cultures met. Instead, researchers from the two countries should delve further while looking at each other with fresh eyes.” Hopefully, researchers will ponder KIM’s words and events like this seminar will lead to future research.